Tamino Resorts to Childish Attempts at Humor But Offers Nothing of Value | Watts Up With That? INITIAL NOTE: This post includes a link to and title of a recent post by Tamino, in which he attempted sophomoric humor in an effort to amuse his audience. While I realize responding to it at the same base level would be fun for many, please do not lower yourselves to his depths on this thread. The reality: 1990 was an ENSO-neutral year, according to NOAA’s Oceanic NINO Index. Therefore, “1990 was…” NOT “…an especially hot year”. It was simply warmer than previous years because surface temperatures were warming then. I’m not sure why that’s so hard a concept for warmists to grasp. The only reason it might appear warm is that the 1991-94 data were noticeably impacted by the eruption of Mount Pinatubo. That was not well received by Tamino. This all began last December. 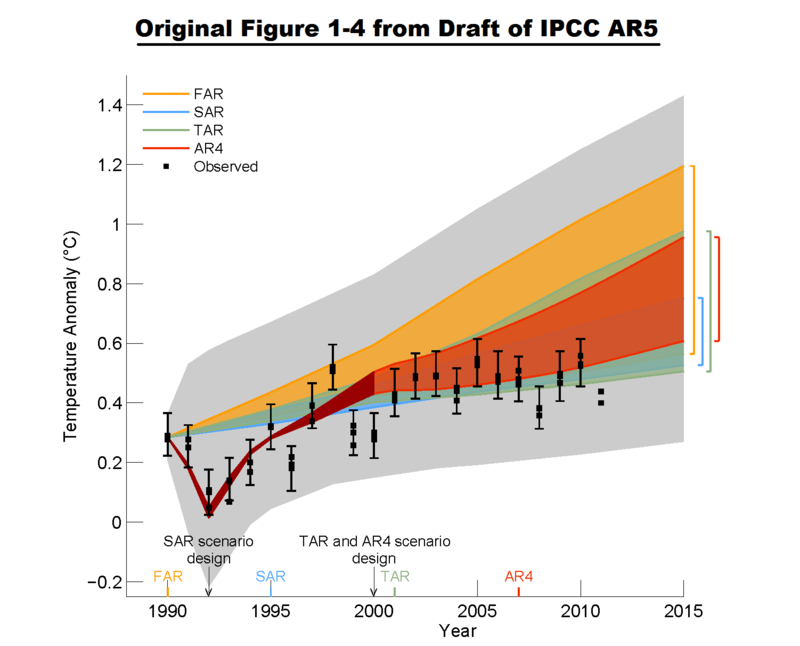 The original Figure 1-4 (my Figure 1) from the IPCC’s draft of AR5 was presented in the WattsUpWithThat post Dr. David Whitehouse on the AR5 figure 1.4. You’ll note that the data for 2011 is outside the ranges of all of the model generations, especially those from the 4th Assessment Report (AR4). Some of you will note that the 4th generation (AR4) models are not included in Tamino’s model-data comparisons. The topic was resurrected when the IPCC released the approved drafts of their 5th Assessment Report. In it, the IPCC changed their model-data comparison of global temperatures in Figure 1-4. (See my Figure 3.) 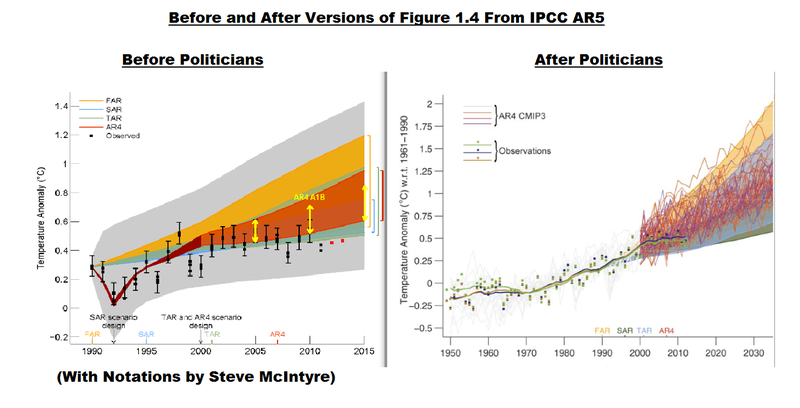 Steve McIntyre reported on the change in his post IPCC: Fixing the Facts. Tamino’s post was referenced on that ClimateAudit thread numerous times. Dana Nuccitelli presented his take in the SkepticalScience post IPCC model global warming projections have done much better than you think. Judith Curry discussed the switch in Figure 1-4 in her post Spinning the climate model – observation comparison: Part II. The switch in the IPCC’s Figure 1-4 was one of the topics in my post Questions the Media Should Be Asking the IPCC – The Hiatus in Warming, which was cross posted at JoNova. Dana Nuccitelli once again added to the discussion with Why Curry, McIntyre, and Co. are Still Wrong about IPCC Climate Model Accuracy at SkepticalScience. 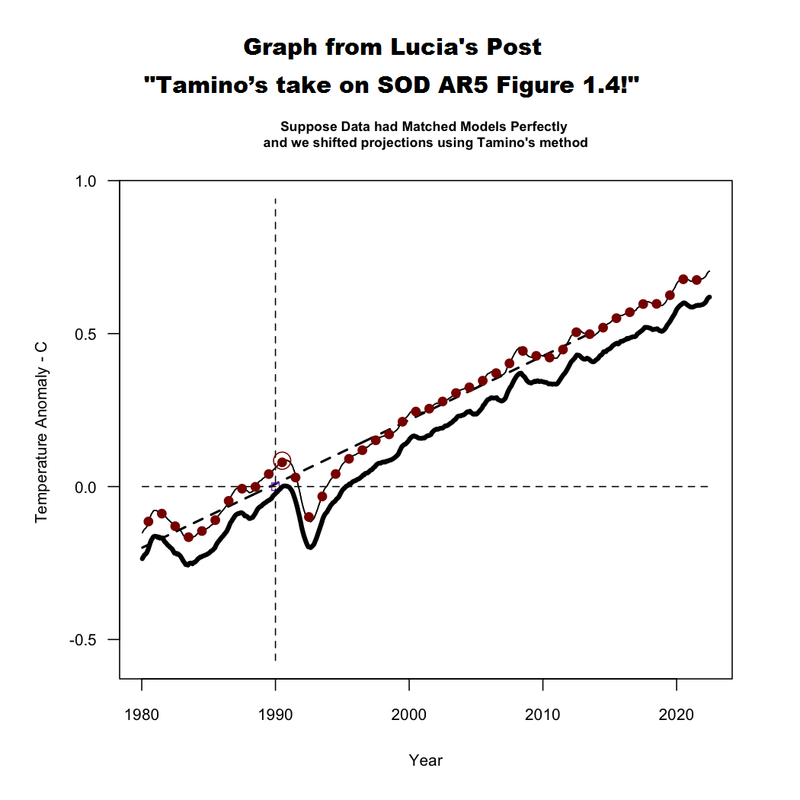 Then Lucia commented on Tamino’s shift in the data in her post at TheBlackboard Tamino’s take on SOD AR5 Figure 1.4! See my Figure 4. I’m tempted to just let the figure speak for itself. But I think it’s better to always include text that describes what we see in the figure. What we see is that if we followed Tamino’s suggests and the models had been absolutely perfect we would conclude the models tended to underestimate the observed temperature anomalies by roughly -.08 C and so were running “cool”. But in fact, our assessment would be deluded. 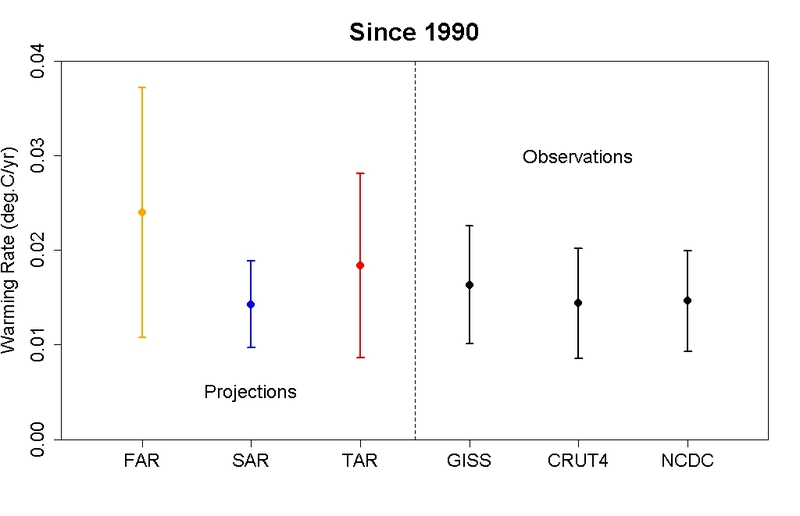 The appearance of “running cool” arose entirely from using different baselines for “models” and “observations”: for the ‘projections’ we used the average over 1990 itself, for the second we used 1980-1990 itself. The shift arises because 1990 was “warm” in the models (and ‘projections’) compared to the average over the full 20 year period. “1990 was…” NOT “…an especially hot year”. There have been a number of additional posts on the subject of the IPCC’s Figure 1-4, including Steve McIntyre’s Fixing the Facts 2, but we’ll end the sequence there. My Figure 5 is Figure 1 from Rahmstorf et al. (2012) “Comparing climate projections to observations up to 2011”. Tamino (Grant Foster) was one of the authors. And for those having trouble seeing the very light pink “unadjusted” data, see my Figure 6. I’ve highlighted the unadjusted data in black. Could the IPCC have based their original Figure 1-4 on Figure 1 from Rahmstorf et al (2012)? NOTE: We’ve discussed in numerous posts how the effects of El Niño and La Nina events cannot be removed from instrument temperature record using the methods of Rahmstorf et al. (2012). For an example, see the post Rahmstorf et al (2012) Insist on Prolonging a Myth about El Niño and La Niña. Also see the cross post at WattsUpWithThat. As noted in the Introduction, Tamino didn’t like the update to my post No Matter How the CMIP5 (IPCC AR5) Models Are Presented They Still Look Bad. Tamino’s response was his post Bob Tisdale pisses on leg, claims it’s raining, the title and text of which is are sophomoric at best. 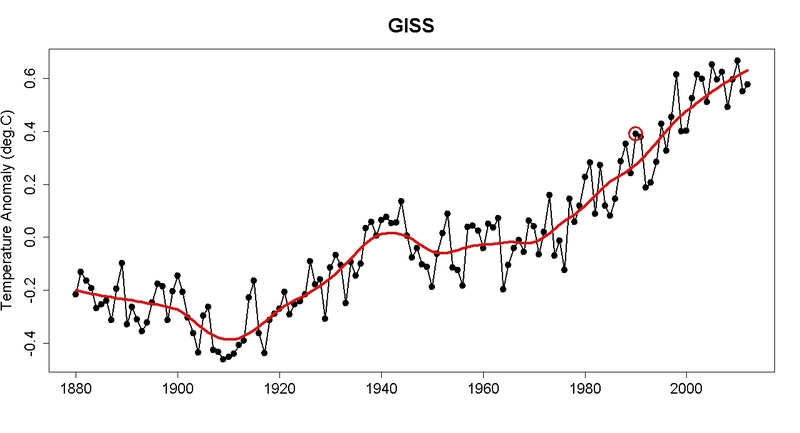 In it, Tamino presented annual long-term GISS Land-Ocean Temperature Index (LOTI) data compared to an unspecified smoothed version (here). He subtracted the smoothed data from the raw data and presented the residuals (here). 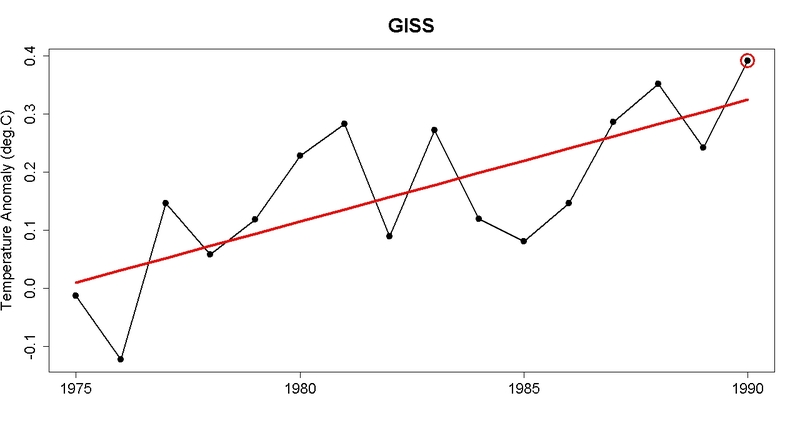 And in response to my note about the impacts of Mount Pinatubo in 1991, Tamino presented the annual GISS LOTI from 1975 to 1990 along with a linear trend line (here). 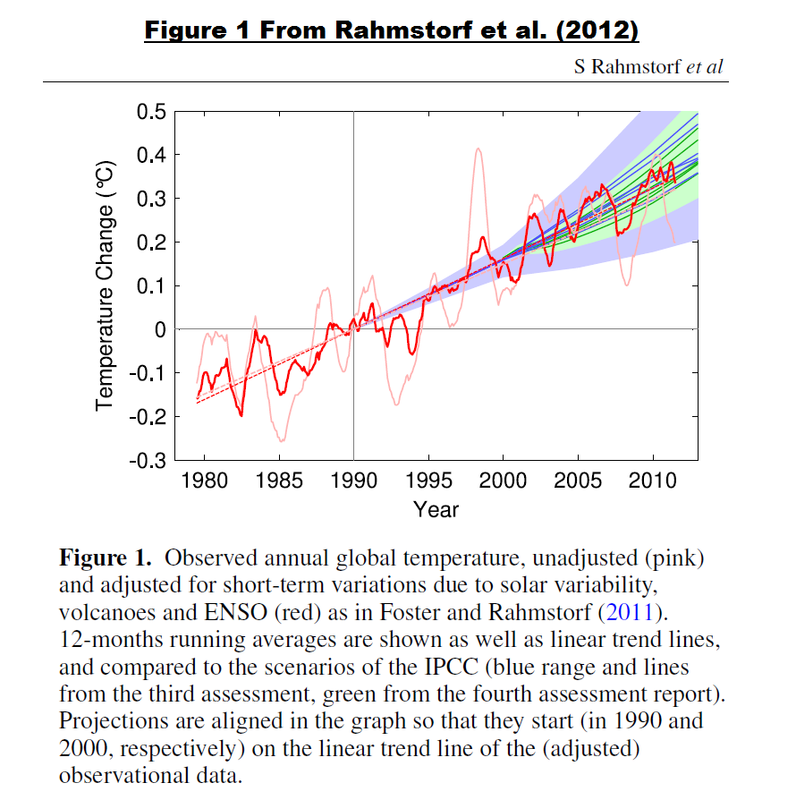 After my first scan his post, it occurred to me that Tamino elected not to use the adjusted data from Foster and Rahmstorf (2011) “Global temperature evolution 1979–2010”, but more on that later. Tamino presented data as Tamino wanted to present data. That’s fine. But there are other ways to present data. Apparently, Tamino assumed that I made a statement that I could not back. …in order to avoid any discussion of what is ‘the best’ data set. So we’ll use that as a reference in the following example. If we average the five global temperature datasets for the period of 1979 to 2012 and simply detrend them using a what Tamino calls a “simple linear trend”, Figure 7, we can see that the residual temperatures for 8 years exceeded the 1990 value and that two others were comparable. Based on my presentation of data, I will continue to say that 1990 was NOT especially hot. NOTE: I enjoyed the comments on the thread of Tamino’s post. One of them even reminded me of the happy grammar school games of morphing people’s names: see the one by blogger Nick on October 5, 2013 at 8:39 pm. But typical of those who comment at Tamino’s, Nick missed something that was obvious, and it was obvious back then even to six-year-olds. He could have been even more clever and replaced “dale” with “pail”. That would have been much funnier, Nick…to a six-year-old. Then again, maybe Nick is a six-year-old. WHY WOULD TAMINO AVOID USING HIS ENSO-, VOLCANO- AND SOLAR-ADJUSTED DATASET? The answer should be obvious. The adjusted data did not provide the answer Tamino wanted to show. I mentioned both ENSO and volcanoes in the update to my post No Matter How the CMIP5 (IPCC AR5) Models Are Presented They Still Look Bad, stating that “1990 was an ENSO-neutral year…” and “…that the 1991-94 data were noticeably impacted by the eruption of Mount Pinatubo”. 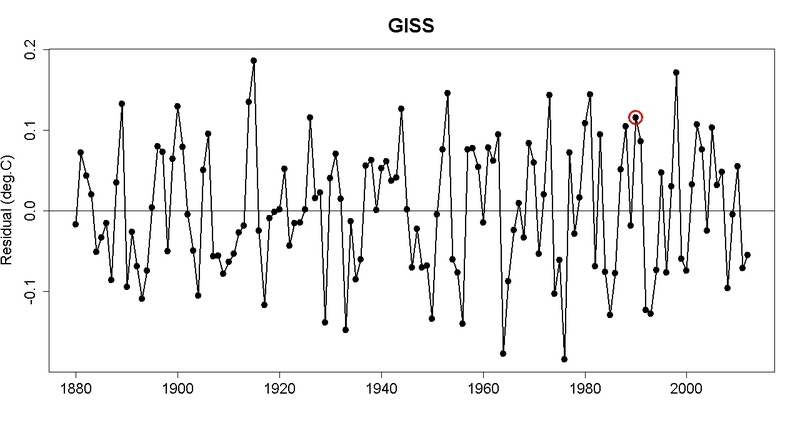 Since B-Tis leans on ENSO so much, why not correct the GISS using the SOI and throw it back in his face? My Figure 8 is Figure 8 from Foster and Rahmstorf (2011). It’s easy to replicate using any number of methods. See my Figure 9. I simply used the x-y coordinate feature of MS Paint. The 1990 value in Figure 9 does NOT look especially hot compared the linear trend. 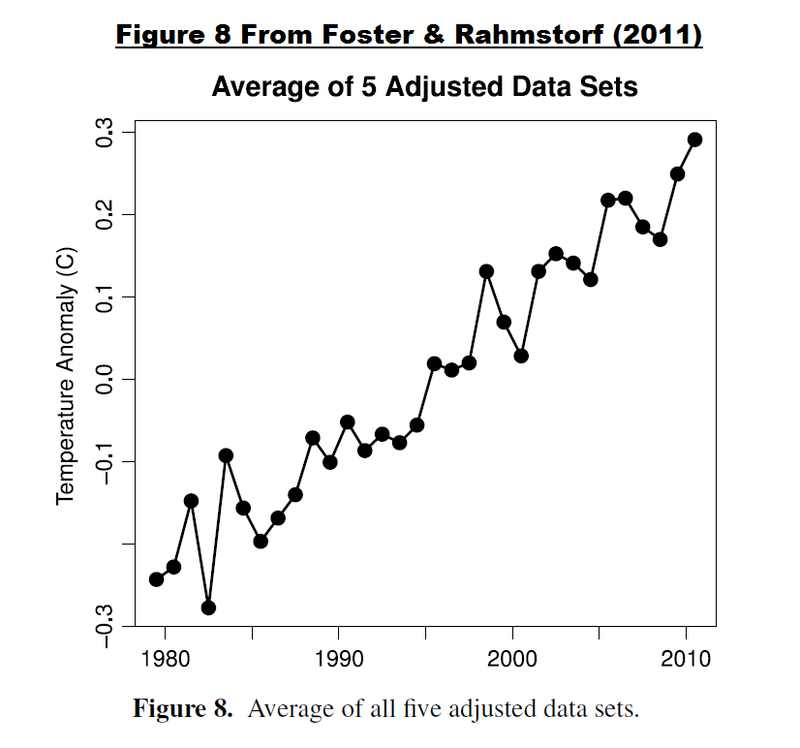 Let’s detrend the replicated adjusted data from Foster and Rahmstorf’s Figure 8 to see if that’s correct. See Figure 10. The residual values for nine years were warmer than the not-hot-at-all 1990. Note to WebHubTelescope: That’s why Tamino ignored you. So what can we conclude from this exercise? Tamino presents data as Tamino wants to present it, using methods that can differ depending on his needs at any given time. But there are multiple ways to present data. Tamino came to one conclusion based on how he elected to present the data, while I came to a totally different conclusion based on how I presented them. Tamino presented a graph at the end of his two posts I’ve linked herein. (See the model-data trend comparison here.) It illustrates the observed trends versus the trends projected from the models used in the IPCC’s 1st, 2nd and 3rd Assessment Reports. Dana Nuccitelli must have believed that illustration was important, because he included it his post Why Curry, McIntyre, and Co. are Still Wrong about IPCC Climate Model Accuracy. Or just as likely, Dana Nuccitelli was using it as smoke and mirrors. The 1st, 2nd and 3rd generation climate models used by the IPCC for their earlier assessment reports are obsolete…many times over. No one should care one iota about the outputs of the 1st, 2nd and 3rd generation models. The most important climate models are the most recent generation, those in the CMIP5 archive, which were prepared for the IPCC’s recently released 5th Assessment Report. Of second-tier importance are the CMIP3-archived models used for the IPCC’s 4th Assessment Report. And what do we understand about the models used in the IPCC’s 4th and 5th Assessment Reports? I was going to ignore Tamino’s recent post, and I managed to do so for about 3 weeks. But I figured, in addition to confirming why I believed the data showed 1990 was not unusually hot, I could also use my reply to once again illustrate examples of the flaws in the current climate models used by the IPCC. And in the post Open Letter to the Honorable John Kerry U.S. Secretary of State, we illustrated how the climate modelers had to double the rate of warming of global sea surface temperatures (left-hand cell of Figure 12) over the past 31+ years in order to get the modeled warming rate for land surface air temperatures (right-hand cell of Figure 12) close to the observations. In the post IPCC Still Delusional about Carbon Dioxide, we illustrated and discussed how the climate models used by the IPCC do not support the hypothesis of human-induced global warming, and that many would say the models contradict it. Over the past year, I’ve presented numerous failings exhibited by the latest generation of climate models. Those failings were collected in my book Climate Models Fail. And as I’ve discussed in a multitude of blog posts here and at WattsUpWithThat for approaching 5 years, ocean heat content data and satellite-era sea surface temperature data both indicate the oceans warmed via naturally occurring, sunlight fueled, coupled ocean-atmosphere processes, primarily those associated with El Niño and La Niña events. See my illustrated essay “The Manmade Global Warming Challenge” (42mb) and, for much more information, see my book Who Turned on the Heat? Sales of my ebooks allow me to continue my research into human-induced and natural climate change and to continue to blog here at Climate Observations and at WattsUpWithThat. 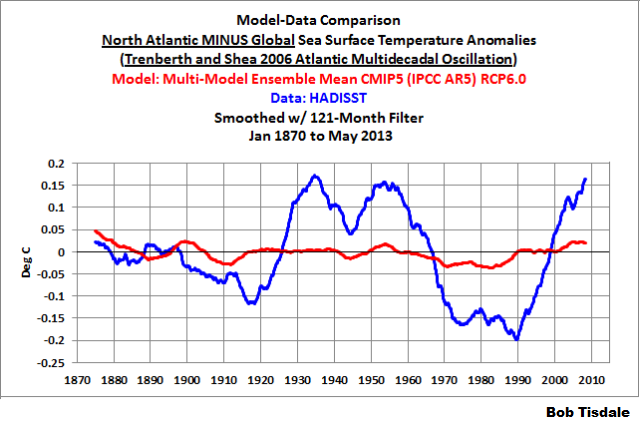 Tamino expressed a complete lack of understanding of the Atlantic Multidecadal Oscillation in his post AMO. My reply to it is Comments On Tamino’s AMO Post. See Tamino’s posts here and here, and my replies here and here. My replies were also cross posted at WattsUpWithThat here and here. Tamino didn’t like the point where I showed the model projections intersecting with the Ocean Heat Content data. Then RealClimate corrected their past model-data comparison posts. Refer to the RealClimate post OHC Model/Obs Comparison Errata. 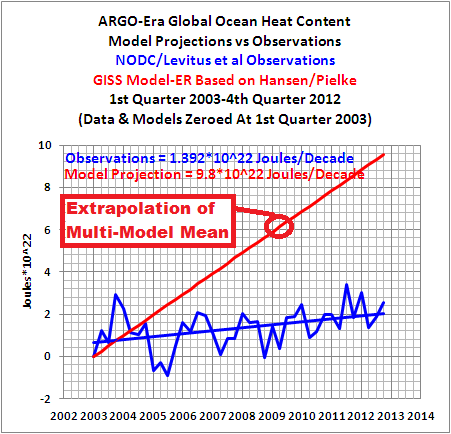 As a result, Gavin Schmidt then corrected the ocean heat content model-data comparison graphs in his earlier December 2009, May 2010, January 2011 and February 2012 posts. Refer also to my discussion of the RealClimate corrections here. Now the comparison in [Figure 1 from that post] , which has been updated through December 2012, appears overly generous to the models—that I should be shifting the model projection a little to the left. And as a reminder, while it would be fun, please refrain from sophomoric humor on the thread. Most of the responses to Tamino are way too obvious anyway. October 26, 2013 in Climate data, Modeling. Tamino is the main character in Die Zauberflöte; and Zauber is magic; indeed a very appropriate description for the games the warmist computer programmers play. A kind of wink-wink-nudge-nudge by an insider. The climate models have failed. Did I mention that the climate models have failed? Politicians know nothing about spin. The Calamastrologists are now the experts in spin, misdirection, misinformation, fraud and lies. The IPCC is among the very best in this dark art. I definitely specialized in the wrong field! If we had made predictions that we didn’t make, then the enterprise wouldn’t be falsified. Nothing different from: If we didn’t have the thermometers we had, but the thermometers we wanted, then we would have temperatures we desire from places we aren’t. You really, really have ‘lost the plot’. He did not use a ‘hot year’. That was the main point of the post. Averages of anomalies of averages of something which, when averaged, is physically meaningless. Boy, I can see how that would be useful. Don’t give this jerk “Tamino” the benefit of anonymity. His name is Grant Foster, he lives in Portland Maine. Use his name when discussing his claims, if he stands behind his work, then he should have any problem with his name being applied to it. * The AMO index has overall a double-peak appearance over the past hundred years (as in, for instance, http://bobtisdale.files.wordpress.com/2013/10/figure-3.png including the 1930s being a particular high after warming during the early 20th century, the 1970s of the global cooling scare period being a low, and it going up again by the end of the 20th century). * That double-peak appearance is very recognizable for being similar to the general pattern in both high northern latitude temperature history and actual global average temperatures meanwhile — if one is familar with actual temperature history, as opposed to how the CAGW movement rewrote prior data to change the latter towards a hockey stick (as illustrated in the next link). * The above is unsurprising when considering that a definition of the AMO index, how it is calculated and derived, is temperature averaged over the North Atlantic minus global mean temperature. In every Holocene warm period (such as the Medieval Warm Period, the Holocene Climate Optimum, the Modern Warm Period, etc), both the arctic and high northern latitudes near the arctic warm more than the global average. It is no coincidence that the AMO index has a double peak appearance in the 20th century, like actual 20th century temperature history, for it is a form of temperature history by definition. The AMO index, high northern latitude temperature, global temperature, and solar activity will all overall go down in the near future, with solar activity starting to plummet later this decade (for the current solar maximum is ending). Even that would be data untrue as usual for the CAGW movement, due to falsehoods including the global temperature history itself having been rewritten as previously noted (illustrations also in prior link), while his incorrect adjustment for solar variation would be their standard practice of ignoring how the overall effect of solar variation (with modulation of cosmic rays) is several times greater than variation in TSI alone. I saw that name just today at that French store, kinda. Your post alludes to an issue I think important. Tamino aka Grant Foster is an academic and, therefore, he benefits his career by increasing his publication score with every paper he publishes in the peer-reviewed literature. Hence, anything Foster publishes as ‘Tamino’ on his blog is ‘work’ which he has done and which he considers is not worthy of publication because it is so poor that he refuses to put his own name to it. Simply, everything Foster posts on his blog under his fake name is ‘work’ which he has himself rejected as being rubbish. I fail to understand why anybody takes any notice of any of the rubbish posted by Tamino except to point out how wrong it is (as Bob Tisdale does in his above essay). It is worth remembering that Tamino (Grant Foster) has tangled with Tisdale before. Because Tamino’s first line of defence is to disparage the opposition and, thus, imply that his opponents are not worth considering. As the subject is complex this policy has effectiveness. But Tamino (Grant Foster) has tangled with Tisdale before. And Tamino has not been able to brush Bob Tisdale away… Tisdale can keep standing up. He can say “Look”. Tamino needs a better defence than merely, “Don’t look over there, This is your card”. Wonderfully entertaining, Bob. And so much work …. Amazing how they never thought of disappearing the 1998 temperature peak in the early 2000s when the ENSO-induced warming trend suited their purpose. Now that the 1998 peak belittles the recent temperatures, they attempt to make it go away by de-ENSOing it. Pathetic. So much deception. I didn’t see where you broached the topic but I believe Bob Tisdale has mentioned it in passing. The models… could use a little work. I’d start by deleting just the lines after the first comments and then tweaking the programs from there. As valid as it is, no matter what name he uses. It probably bears mentioning… 1990 was selected as a start date not by skeptics, but by the UNFCCC. What is reasoning for zeroing the models and observations at 1990 or any date for that matter? It seems to me that zeroing the data at a specific point makes the models appear to be closer to reality than they may possibly be. 1990 was the most neutral year one can get. The average ENSO value (with a 3 month lag) was 0.03C (certainly Zero in ENSO terms with an impact on the global average temperature of 0.002C). The average AMO index (which Tamino/Grant Foster always ignores since it has a 60 year cyclical impact on temperatures) was 0.01C with a global temperature impact of 0.006C. There were no volcanoes (as Pinatubo did not occur until June 1991) and the solar cycle could have possibly had a +0.04C impact (if it has any). All together, natural variables might have had a +0.05C impact on 1990 temperatures. Hadcrut4 was 0.29C in 1990 (or maybe 0.24C adjusted for natural variables). IPCC AR4 multi-model mean (under A1B) was 0.27C (bang on or close enough so that no adjustment is required). IPCC AR5 multi-model mean (under RCP 6.0) was 0.32C (so maybe a 0.07C could be adjusted lower for it). Fake Tamino/Grant Foster/Nuccitelli adjustments once again. The issue really is that many people believe when these two individuals just change the numbers to suit their purposes. Many human beings are gullible and fall for this garbage and there is nothing you can do about it (you as in anyone reading this). if the Model hindcasts are determined by forcing rather than trends, shouldn’t the model ensemble (and therefore future projections) be tied to the observations using the Pinatubo response (clearly evident in both models and obs), rather than zeroing at 1990? Aren’t the climate models supposed to simulate random variability to some degree? My understanding was that they included volcano and ENSO variables even though they can’t predict specifically when they will occur that way the models would be correct over a longer period. There are two different universes here. 1) In Foster’s universe (cool sunglasses, by the way) we are all going to die tomorrow (or soon) because the (adjusted) charts indicate such. 2) In the REAL universe, temps oscillate back and forth on some seemingly random mission, yet to be fully understood, that only somewhat affects live on Earth. No one can understand universe 1, but someday, maybe, we can understand universe 2. Oh boy, Grant Foster, another layer of adjustments by ‘modelers’ and ‘climatologists’ over what has already had adjustment applied layered over adjustments. That everyone, and I mean everyone, seems to just be chasing adjustments… such from USHCN & NCDC that all global ‘datasets’ are built upon? Did I mention the adjustments? Has anyone here been brave enough or industrious enough to look at what the completely pre-adjusted data generally looks like? Even roughly is close enough. You might not be able to find that unadjusted data but the adjustments are published so roughly remove them and take a look at what remains. It is quite simple and it is quite an eye opener. In 1555, Nostradamus published his work The Prophecies. In the work he stated that his prophecies were good from then until 3797. And that they applied only to Europe, Africa, and parts of Asia. His prophecies have, at various times, been zeroed geographically to the United States and reinterpreted in light of 9/11, the Space Shuttle Challenger, and various other calamities and disasters. This then proves that Nostradamus correctly prophesied the future. Just out of curiosity, where is the line between regular humor and sophomoric humor, I’ve been told at least twice not to cross it. Comparing anomalies is ridiculous if you don’t align them to the same absolute starting conditions. It’s like taking a 100 volt signal and saying it matches a 1 volt signal because I can aline them on the oscilloscope. The only thing I can compare is the pattern of the two signals. The real values are not comparable by using anomalies. The only valid comparison here is the trends. Great work, Mr. Tisdale. Thanks for keeping us up to date on what I will call Tamino’s childish efforts at misinformation. Yes, the raw data has been tampered with, repeatedly. Those charged with maintaining the data integrity have engaged in criminal behavior, in my book. These days, that’s the way the US government operates and the world is worse for it. Nah that’s the new normal of post-instrument science. Has anyone here been brave enough or industrious enough to look at what the completely pre-adjusted data generally looks like? Even roughly is close enough. Yes. in 2011 Zeke and I did a poster using around 25000 daily unadjusted stations. The answer is the same as using any other dataset. you could do the same thing with hourly stations. Answer? doesnt change. Grant Foster has quantitative skills that could actually be put to good use in climate data exploration. Frankly, his functional numeracy towers over that of most who comment here, at CE, & at the Talkshop, but he’s not trustworthy. He’s obsessed with distorting in support of his political beliefs. It’s so transparent, it undermines his cause. Under more favorable circumstances — and if he were honest — I would like to work with him. Bob has a gift for understatement. Bob’s Figure 2 & particularly Figure 3 tell a most d*mning story that common folks plainly understand. I’ve shown that comparison to people. They shake their head at the level of corruption they realize must be in play in order for a “revision” like that to have taken place. Could one even succeed in engineering such a d*mning “revision” if they tried deliberately to do so?? It’s not clear if they could. Accuracy in labels is a scientific fundamental. Note to self: Don’t spell fr–awh-d in the normal way. Sigh. We see from this Tsidale post that Grant feeds Nuccitelli talking points for his Guardian pieces. OK.
Grant’s attempt via Nuccitelli to undo the negative PR from AR5’s model failures gives skeptics an important insight into the weakness of AR5 support efforts. There is no ‘A’ team defending the very public AR5 model failures. Yes Steven Mosher, I would like to see how this basically linear sloped adjustments (http://i39.tinypic.com/1zfrn1l.png) were used to be superimposed over the averaged global temperature records. Doesn’t look like time of observation adjustments to me, wasn’t that change over a very short period of time or will that upward adkistment just keep on its track upward? I see no cease in the adjustments. And if it was only US data that adjusted, why when viewing what appears to be a correct relation to history comes out when I remove those US only adjustments from a global scope anomaly chart? http://i39.tinypic.com/1118rnl.png which doesn’t appear anything close to datasets shown today. As for you and Zeke’s analysis, I would rather do it again personally as you suggest. So do you have a link where untouched daily (and/or hourly) per station temperature records are located for download by the public? Tried BEST but that ‘raw’ station data is already touched and de-trended, isn’t that correct? MSM is still obsessing over this fake story with Will Steffen weighing in today. Video, approx 12 minutes of Tim Lester interviewing Steffen & i warn it’s pretty SANCTIMONIUS stuff from both. yet even the headline is only about increasing PROBABILITY! “We would certainly prefer that this debate be elevated to the real scientific facts as are reported in the scientific literature and as are assessed very competently by the IPCC, the CSIRO and the Bureau [of Meteorology] and the scientists we rely on,” Professor Steffen said. How many angels can sit on the head of a pin? Let us take the assumption that the local temperatures, around the globe, are normally distributed around an average. Are the measurement sites also normally distributed? Nope. 3/4 of the planet is sea, 1/4 is land. And of the land there are numerous perverse and varied geographical features that contribute to, and sometime determine, the local climate. Mountain ranges, precipitation, cities, farm land, etc. And that’s not counting all the variations in trade winds and so on that occur over both land and sea. So even if the temperatures are normally distributed, the local climates and features are not. And since we don’t have equidistant thermometers across the globe it’s not even an opener to the discussion. One cannot get from, I measured 3 automobiles and they had 4 lug nuts, to lug nuts are linearly distributed between cars. The only hope for global temperatures proper, and from there on to finding a legitimate trend is via satellites. Which seem to have a terrible habit of unexpected malfunctions. All the malfunctions occur with declining temperatures, so lots of room for conspiracy theories. But in the absence of conspiracy theories it means we have to wait for the eggheads to finally sort out how to put a reliable thermometer on a spacecraft. I don’t want to sink too low, but I hope I can be forgiven a little harmless fun. I haven’t an inkling of where the pen name Tamino comes from, but Grant Foster sounds suspiciously like a reference to a means of making a living. Tim Groves @ 10:19pm today — Nice work by your brain! Could be, could be. more misinformation & propaganda for the CAGW CAUSE which has dominated Australian MSM for nearly a week……..
Pat, I’ve been looking for some data covering the brush fires, as far as incidence and whatnot, but, can’t find it in nice ready form. There certainly is no connection for the US or Canada. And, a paper says the fires in Europe at a low. Simply, everything Foster posts on his blog under his fake name is ‘work’ which he has himself rejected as being rubbish. Perhaps you have sorted through the blog which Foster uses as a rubbish bin, and you have found something Foster threw out by mistake. If so, then you don’t mention it. There is much work from many people which merits time and effort to consider. So, when Foster has decided that of his ‘work’ which is rubbish and he has thrown it away then I see no reason to bother considering that. Re your post at October 26, 2013 at 4:56 pm. Repeating your inane error which has already been refuted only demonstrates your inanity. No. The projections are anomalies so can be “zeroed” to any value. And they are projections of reality or they have no meaning, so “Pinatubo response” is part of reality. (b) the reality which has evolved over the time the IPCC has been providing projections. The models fail at the first calculation. CO2 is still rising yet head isn’t. The warmist alarmists are in denial as they are still convinced that there is warming. You are really on top of this and I have concluded after reading all the above that we should each pick a corner to vigorously defend. I have no doubt that you are advancing not only our general understanding but forcing the junk science blogs to correct, confess and cavil in response to your analyses. Foster’s prevarications smack of desperation quite literally. What on earth will they say after 10 more years of cooling? I expect the more honourable among them, or shall I say the least dishonourable of them, to start tossing their wild-child point-men under the proverbial bus. They are on the road to scientific perdition. Why push the cart? Is this a real career? @Foster: Honesty is the foundation of all virtue. History books are being written. Turn your back on these alarmist clowns and use your talents to expose the junk science. It is not Bob Tisdale you should fear, it is the perspicacious pens of our grandchildren that will cause knees to quake and cheeks to blush. Get on the right side of history while you can. Tamino aka Grant Foster is an academic…..
Grant Foster (s.c.Tamino) may be an academic, but it is of a very poor quality. GF crawled out from somewhere and said that I fabricated the data! My response was that he was talking nonsense. This was met by torrent of a vulgar abuse, Gavin confirmed that data was correct and removed all s.c tamino’s abusive comments. Apparently GF was not amused and for some months did not comment on the ‘RC’. Grant Foster has actually written textbooks on time series analysis primarily dealing variable stars. He knows what he is doing. 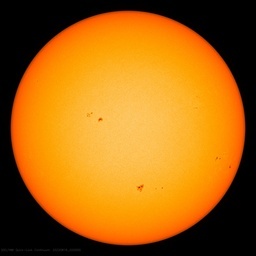 Even though he is a math expert in astronomy, he still used an outdated, faulty dataset for the Sun’s total solar irradiance in his Foster Rhamstorf 2011 paper. Everyone knows this dataset is based on sensors which are suffering from degradation, yet Foster still used it despite being an expert on the data of stars and the peer reviewers let him use it. He has shown what type of integrity he believes in. Perhaps Tammy might point us to some climate models from 10 years ago, that forecast no warming till now? Bill no one knows this stuff better than you. The fact other blogs that highlight this one “cherry picked” one or two lines of your first comment speaks volumes of the mentality of the AGW cult. They know they are done, when you present facts they run home to Mumma and hide them. Why does Grant’s blog give itself the highly misleading title of ‘open mind’? Maybe it’s short for open mind, insert foot? I agree. We should NOT be knocking them – we should be encouraging them to come up with ever more excessive propaganda. That will result in a larger and more rapid collapse…. Not being an expert on the academic peer review process, I am curious if it is anywhere near as vigorous as what happens on WUWT. One thing for sure, the WUWT review process is far more transparent and open. I have often wondered why the academic peer review process has not evolved to be more open and transparent. In the world of the internet, the academic peer review process seems antiquated and outdated. If I were an academic climate scientist, I would consider reading WUWT required reading each day since there is so much debate occurring. Grant Foster’s participation should be evaluated and reviewed as anyone else. The debate is yet another indication that the science is not settled. That is healthy. We need more academics participating in the open debate. It would strengthen academia. What is most interesting to me is that it is difficult for a human without instrumentation to discern a one degree temperature differential let alone a .1 degree or a .01 degree temperature difference. Then graphs a splattered with .01 degree temperature differences across decades and an industry is born. So much has been said about so little and so much money has been spent on events that no one can feel. Thank you Bob. Excellent work again. I think that running a trend line through the model mean since 1990 and running a trend line through the real data since 1990, then comparing the slope of the two is all that is needed to show how bad the IPCC models are. Adding trend rate error bars would show that the real data is also out of those error bars, and the baseline selected for the models would be unimportant. Since slope would be all that was being compared, the starting points for the trend lines should be the same. Every time Bob Tisdale steps up to the plate his transparency is there for all to see. Workings, reasoning, objectivity and when appropriate, corrections. It’s an education all right. History will be generous to the likes of Bob – and WUWT for offering the platform for truth. Great work as ever, Bob. Tamino? Another legacy entirely awaits you my friend. Its called the ‘Foster’s post normal engineering method.’ Modify the data to fit the theory. This is standard practice in AGW pseudo-science. Mr Foster’s method reminds me of all the desperate efforts by alarmists. Like that traitor hanging on tenaciously to Richard Burton’s boot on that cable car hundreds of metres above the ground in Alistair MacLean’s WWII movie and book ‘Where Eagles Dare’. It’s a shame to see good people being forced to work daily to refute this incessant flow of nonsensical drivel from the Warmista Camp, when there are real problems to be solved around the World. Right – energy poverty, clean water, pathogens, food. These idiots are driven by a hatred of the human race. Why does everyone still use “Tamino” when you have the person’s real name?? It would appear that the greatest damage you could do to his reputation is to have his real name associated with his words and deeds. His name is Grant Foster. Let us start using his real name from now on. He’s earned it many times over! Same reason Real Climate uses the word “Real” in its name, or that “Climate Science” needs to add the name “Science” to its name, or various countries add the word “Democratic” to their names. If you need to add words like Open, Real, Science, Democratic to a name, it is because you are not what you advertise, but you would like to pretend you are. And now for something even more unbelievable. In the post, I referred to a comment on the thread at Tamino’s blog by the blogger who calls him/herself WebHubTelescope. Naturally, I corrected WebHubTelescope in a later comment. Standard type of trick used by governments who don’t like, say, unemployment figures. Change the way you define it. They often get away with it, too. WebHubTelescope’s model gets it 60 year cyclical component by using the some of Length of Day index (I don’t know which one is used and the inverse of the common measure comes kind-of close to the 60 year cycle). But I dare him to use the historical LOD data beyond 1880 in it. His CO2 coefficient will have to go strongly negative (instead of positive) because these are the official estimates back to 1632. LOD says 1623 should have been the hottest in Earth history (despite the Little Ice Age). And what does the LOD have to do with the Earth’s Energy Balance? I don’t know, energy is energy and the rotation affects energy. But does faster rotation equal Earth warming up? That would answer the Faint Young Sun paradox but would not answer 1623’s coolness and Venus’ temperatures which rotates extremely slowly (and backwards) and I think technically, the slower the rotation the hotter the earth will get but that’s just me. yeah, I see your point about anomalies, they can be zeroed anywhere. Apparently the hindcasts are not tuned to trends pre-2000 (RealClimate), therefore a curve fitting exercise (ala Tamino) is not appropriate. The hindcasts are driven by radiative forcing. Zeroing at 1990 is basically the same as zeroing Pinatubo (coincidence?) and I suspect that was a consideration in the initial model “comparisons”. I believe Tamino has made the mistake when shifting the trend, he has actually shifted the forcing, and that would be wrong if the model forcing is tuned to Pinatubo. Skimmed through Rahmstorf et al (2012). This could be worthwhile, hard to say with so little apparent detail about their statistical analysis. “Multivariate correlation analysis” is presumably just fitting a multiple linear regression to temperature using three explanatory variables. Big problem? – these time series are clearly highly autocorrelated. Well known (back to Yule(1926)) to lead to spurious correlations, in this case meaningless regression coefficients. 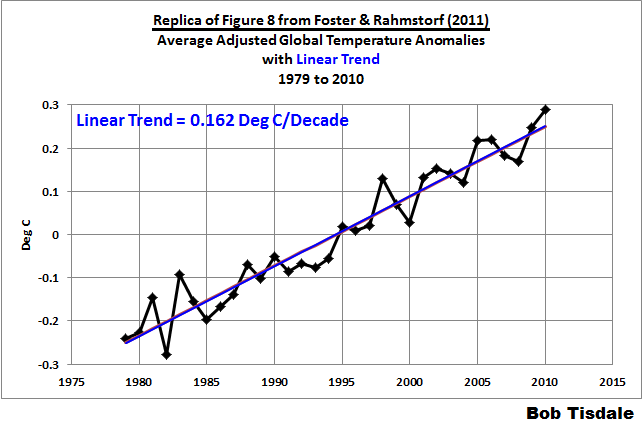 Presumably, the regression residuals constitute the ‘adjusted temperatures’, so there is no goodness-of-fit analysis. The linear ‘model’ could be fitting everything or nothing? This really needs a fourth predictor variable, representing GCM temperatures, together with proper statistical analysis of how well an ARIMA or other model fits the temperature data. Then it will be possible to see the relative performance of the different predictor variables, climate models in particular. My apologies if I am doing Rahmstorf etc a disservice here – the detail I saw was quite limited and I have filled in the blanks with my own guesswork. Tamino’s term “fake sceptic” is every bit as bad as the term “denier”. It is a term of intolerance. I posted a comment on on the original 2011 posting last year. Grant Foster edited the comment, and shortly afterwards closed comments. That should be Grant Foster aka Tamino. Nice paper Bob. It clearly indicates that models are tuned to temperature by adjusting (and re adjusting) TOA radiative forcing, etc. Wouldn’t that mean if you moved the goal posts (as Tamino has done), you are also moving radiative forcing? You can’t do that! Sure, go back into the model and change the clouds, etc, by all means. Do some more tuning. You can’t just move the whole ensemble upwards (as Tamino has done), because it’s a better match. That’s perhaps the most unscientific thing I have ever heard. As stated by “RealClimate”, the match is not determined by trends, it is determined by tuning the model physics to at least a century of data, after running the model for 500 years. Some how I doubt what Tamino did is in the CMIP5-protocol. I agree that the answer is obvious…but I disagree about what the obvious answer is: The obvious answer is that the adjusted data is not what is relevant since nobody was talking about comparing the models to the adjusted data. They were talking about comparing them to the actual data and hence what matters is how warm the actual data was for that year, since the issue is how best to align the two baselines of model vs unadjusted data. 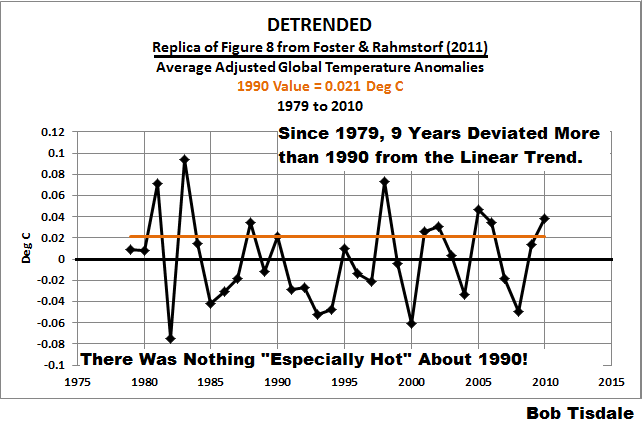 Your own figure 8 shows that with unadjusted data, 1990 was indeed on the hot side, and in fact, your result there showing it to be about 0.07 C hotter than the trendline is in good agreement with what Tamino shows. Far from undermining his argument, you have basically just confirmed it! Until these jokers [meaning the alarmist crowd, not Bob T] start providing full access to not only their ‘adjusted’ data [which is not really data at all], but to all the raw, unadjusted data, they are playing games. Hmmm. I look at wood for trees averages (averaging over 2 years) (my first try at trying to replicate any one of your thirty graphs) and I see three peaks post 1997 and the biggest of them of them is at 1990. So I would have to agree with Taming on this one and I am skeptical of your claims. Are you familiar with the wood for trees web site? It’s very easy to use. That’s Mr. Tisdale to you. Are you familiar with EXCEL? It’s also very easy to use. That way you can attempt to replicate what I presented, instead of guessing. What’s obvious is you had failed to read beyond what you had quoted. We appear to have different definitions of “especially hot”, joeldshore. Looking at my Figure 8, there are 19 years “hotter than the trendline”. The average positive deviation of those 19 years is 0.078 deg C. For 1990, the difference was 0.068 deg C. Being below the average of the years with the positive deviations, doesn’t make 1990 “especially hot” in my book. If you’re looking for an example of “especially hot”, that would be 1998. You are arguing against a straw man of your own devising. The issue is not whether 1990 was so extreme that it was the hottest year ever compared to the trendline. Rather, the issue is whether it was far enough above the trendline that it does not make sense simply to align the data and the models to that one year. In a previous post, Tamino shifted things by 0.1 C to align them (relative to equality in 1990). And, you have indeed confirmed that a shift of nearly that amount is necessary…You find the shift should be 0.068 C rather than 0.1 C, although I am sure the details of that exact number depend on the years used to determine the trendline and so forth. I noticed that you did not even try to respond to my explaining why your idea that Tamino should have used the adjusted data was silly. Wise move. There’s another way in which it is strange for you to argue that 1990 is not an especially hot year: In both GISS and HADCRUT, it is the hottest year in the global instrumental temperature record up to that time. If you want to claim it to be an “average year”, you are basically arguing that global warming is happening so fast that even an average year is capable of setting a new record. That’s an interesting argument because it basically says that the trend is completely overwhelming the “noise”, i.e., the ups-and-downs from year to year. Even I would not make such a strong claim about warming. I think the noise is large enough compared to the trendline that it will almost always take an especially warm year relative to the trendline to set a new record. But, maybe I just don’t appreciate as well as you do how extreme global warming really is? I will try to explain the issue in terms that even you can understand. The globe has been warming from the Little Ice Age (LIA) for 300 years. Clearly, every year since 1940 was “especially hot” if compared to the temperatures of years in the LIA. So, when talking about “an especially hot year” then you need to decide to which years you are going to compare to determine if that year was “especially hot”. The IPCC projections start from 1990 and continue through the present. So, the complete years under discussion Therefore, the years to be compared are from 1990 to 2012. Indeed, look at Figure 1 above which is a copy of a graph from the draft AR5: it starts at 1990. Do you now understand, Joel, that we are discussing the years defined by the IPCC for the IPCC projections and those years are 1990 to 2012. Is 1990 “especially hot year” when compared to the other years being considered; i.e. the years from 1990 to 2012? I haven’t misrepresented anything, thus my argument is not a straw man. This discussion is solely about whether 1990 was an “especially hot year”, as represented by Nuccitelli. Nothing more. Nothing less. Tamino presented his reasoning. And I presented mine. 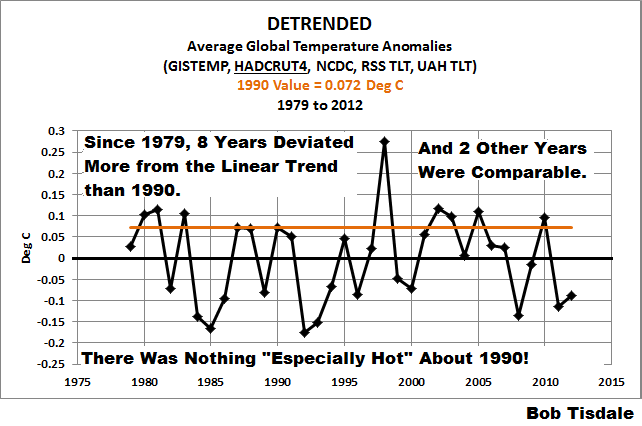 This post and my earlier response to you presents why 1990 was NOT an “especially hot year”. I have no need to repeat it. The 1988-89 La Nina was the strongest La Nina on record. Then 1991 had one of the biggest volcanoes in the temperature record timeline. People should not self-talk themselves into believing another fantasy here. This debate is already over-loaded with made-up conjectures and unbelievable fact-making. I guess Tamino has already added another one, since so many of the pro-warmers have fallen for it, even the IPCC (or let’s say, they have “chosen” to believe it). Clearly Nuccitelli’s statement is true, ‘at the time’ it was the hottest year on record, how could that be regarded as anything but ‘an especially hot year’? Subsequent further warming puts it in a different context, but that’s irrelevant for his statement for which the context was the time up to and including 1990. The ENSO state of the year is also irrelevant, 1990 was the hottest year on record regardless of the ENSO state. It’s more of a red herring than a strawman. A strawman is a fabricated argument, but Bob is refuting something that Tamino did indeed say. It is a red herring though because it dodges the main point. joeldshore earlier said that Bob implies “the shift should be 0.068 C rather than 0.1 C”, which is correct. Basically, this entire post is a semantic argument over the use of the word “especially” in “1990 was…” NOT “…an especially hot year”. Perhaps Tamino should not have used that word in his post. But that argument is a red herring, avoiding the main issue over whether or not 1990 should be used as a baseline. Basically, this entire post is a semantic argument over the use of the word “especially” in “1990 was…” NOT “…an especially hot year”. Perhaps Tamino should not have used that word in his post. But that argument is a red herring, avoiding the main issue over whether or not 1990 should be used as a baseline. I haven’t misrepresented anything, thus my argument is not a straw man. This discussion is solely about whether 1990 was an “especially hot year”, as represented by Nuccitelli. Nothing more. Nothing less. …Except that Dan’s next sentence, which you quoted, is “Consequently, if the models and data were properly baselined, the 1990 data point would be located toward the high end of the range of model simulations.” And, in fact, your results show that Dan is exactly correct. You are trying to claim otherwise by defining “especially hot” to mean what you want it to mean rather than what Dan intended it to mean. But, no matter how you define it, Dan is correct in his sentence that I quoted above. And, your own Figure 7 demonstrates this. And, yet, Bob Tisdale’s own Figure 7 here shows otherwise: It was about 0.07 C above the detrended baseline. 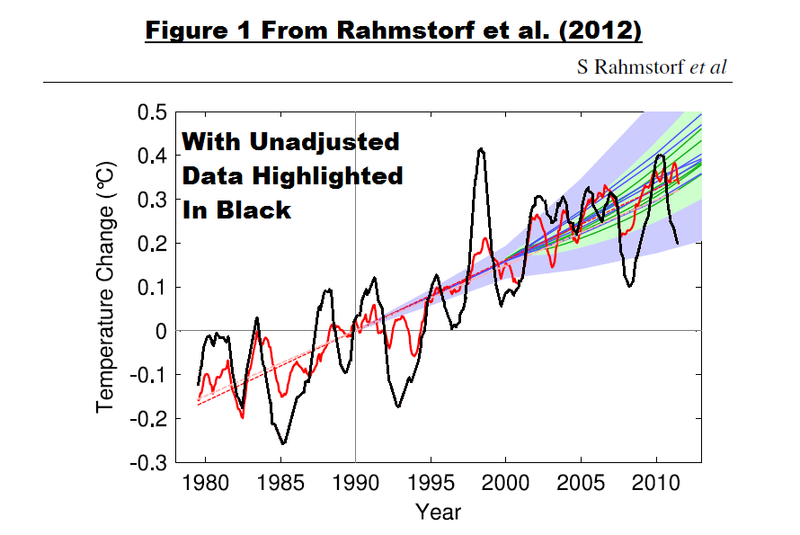 Why did Tamino not use his ‘adjusted’ data set? Because global temperatures are not determined only by the three factors subtracted (ENSO, Volcanic, Solar). If you want to find out if 1990 was an above average global temperature, then you work with the temperature anomaly, not reconstruction minus a few factors. 1990 was not the warmest but was a warm year along the trend. This is seen in your graphs above. That point stands regardless of what ENSO was doing. ENSO does not by itself determine global temperatures (or the fit would 100% perfect). 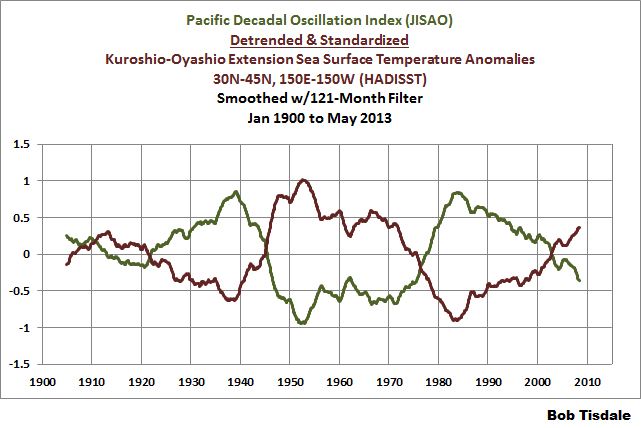 Bob, I think you’ve missed the point WHT was making with the ENSO adjusted series – the warming reappears. He/she was saying, if you are going to remove ENSO to make a point, have a look what happens to the overall trend when you do. Now the haiatus is gone. Now it’s closer to projections. Have you ever plotted an ENSO adjusted temperature series (using your preferred methodology) against the IPCC projections and compared?